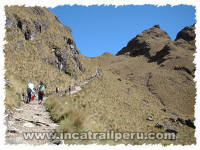 Independent Inca Trail information for visitors to Peru. This is a non-commercial site. 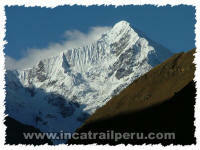 The Inca Trail is by far the most famous trek in South America and is rated by many to be in the top 5 treks in the world. In just 26 miles (43km) it manages to combine beautiful mountain scenery, lush cloud-forest, subtropical jungle and, of course, a stunning mix of Inca paving stones, ruins and tunnels. 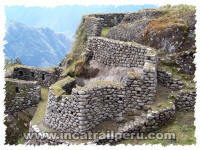 The final destination of the trail just cannot be beaten: Machu Picchu, the mysterious "Lost City of the Incas". 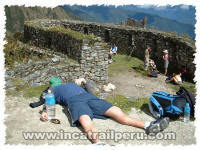 www.incatrailperu.com is an independent guide to the Inca Trail to Machu Picchu aimed at helping visitors to decide whether the Inca Trail is the trek for them. Although there are literally thousands of kilometres of "Inca Trails" throughout Peru this website concentrates on the Classic 4-day Inca Trail trek that starts at km82 (82 kilometres along the railway from Cusco to Aguas Calientes) and treks high up into the mountains passing the Inca ruins of Llactapata, Runkurakay, Sayacmarca, Phuyupatamarca and Wi�ay Wayna before finally arriving at Machu Picchu for sunrise on the 4th day of the trek. We have include information about when is the best time to do the trek, how best to prepare for it, and advice on how to choose a tour operator best suited to your interests and budget. The Inca Trail to Machu Picchu really is an beautiful trek and we hope that with a little advice and planning it turns out to be an incredible and unforgettable experience. 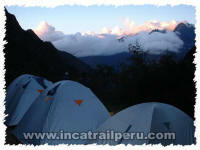 Good luck and happy trekking! This is a non-commercial website. Copyright Andean Travel Web 2000-2018. 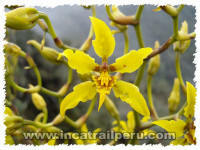 All material used within this web site is original work and is subject to international copyright law. Unauthorized reproduction is strictly prohibited without prior permission from the editor. This web page was last updated in November 2018.